>An office mystery & Can you spare a square? Amy Ruiz Fritz April 6, 2011 April 6, 2011 No Comments on >An office mystery & Can you spare a square? Apparently, gnomes roam my office at night. Every morning when I go into the break room to get some water to brew a pot of coffee, a plethora of dirty mugs and glasses have appeared in the sink. Now, I know for a fact that the sink is empty and the dishwasher is full when started at 5:00 PM every day. I’m also pretty sure that anyone in my office who stays after 5:00 PM doesn’t roam the cubes and conference rooms gathering mugs and glasses. One day I’m going to try to be the first one in the office to see if I can catch the gnomes in flagrante delicto. It has to be gnomes because seriously, these are the same people who leave an empty roll on the paper towel dispenser. Although, I have also seen dirty dishes find their way into the sink during the day when the damn dishwasher isn’t full or clean…I must investigate this situation further. A mystery is now afoot! Speaking of mysteries in the office, I am now baffled by stickers on the toilet paper. That’s right. My assumption is that the property management is attempting to be “green”. 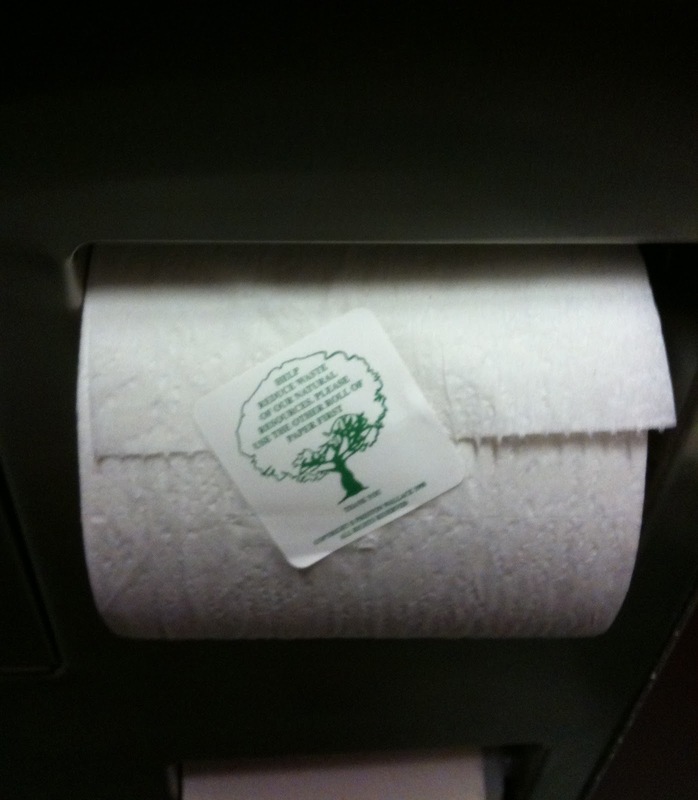 At least that’s what I gleaned from the oak tree on said sticker and the plea about our natural resources. Now the pictured roll has been in place since Monday. I’m tempted to rip off said sticker just to be mischievous, but I want to see how long that roll hangs out. I apologize for the fuzzy photo, but I was afraid that someone might catch me taking photos in the stall. That’s just weird, even if it is just for a blog post.